member of the access tier of the vCloud Air ISV program and is listed on the VMware Solution Exchange. Leveraging hybrid clouds has substantial benefits and everyone wants to take full advantage of them. Since Barracuda's NG Firewall, Spam Firewall, Spam Firewall, and Message Archiver can easily run on VMware, these products can easily make the move with you. This provides an easy transition for your critical workloads. VMware vCloud Air is a public cloud platform built on the trusted foundation of vSphere; it's compatible with your on-premises virtualization deployments. This makes it easier to extend existing workloads to the cloud, and spin-up new application VMs. The point is, you have flexibility with VMware and Barracuda's product portfolio mirrors that flexibility. Our products can be deployed as a virtual appliance within your own data center or within vCloud Air. Our security and storage solutions can be configured wherever your workloads need protection and availability. There is no need to learn a new hypervisor to run our offerings or encounter new vulnerabilities because your storage and security solution is not cloud ready. Email servers that reside in the cloud and on-premises deserve the same level of comprehensive security, simplified user access, email management, along with redundancy and disaster recovery to ensure eDiscovery/compliance. That's why it's smart to put Barracuda's proven solutions on the job - Barracuda Spam Firewall and Barracuda Message Archiver - sharing the same technology and the same suite of features available in our hardware appliances. Delivered as a virtual appliance, you can deploy the Barracuda Message Archiver in vSphere on premises or in vCloud Air without additional hardware. 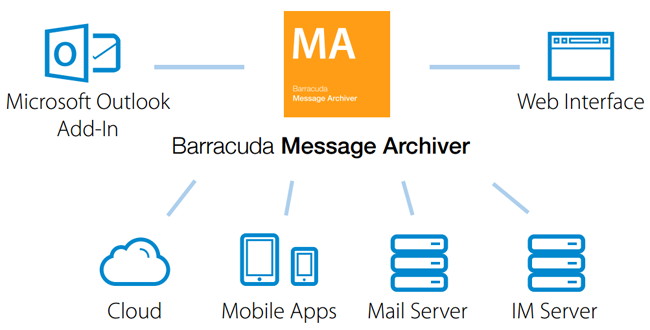 Barracuda Message Archiver is ideal for organizations looking to reduce their email storage requirements and boost user productivity with easy end-user access to any email ever sent or received. The cloud-connected virtual appliance uses the optional Barracuda Cloud subscription to move information to the cloud for disaster recovery or as a secondary tier of storage. In addition, the Barracuda Message Archiver provides a powerful, yet simple platform for eDiscovery and compliance. The cloud-connected Barracuda Message Archiver uses the Barracuda Cloud to move or copy data to the cloud. Setting policies in "mirror" mode replicates all data to the cloud for disaster recovery purposes. Setting the policy to "Rotate" mode allows the appliance to scale-up and use the cloud as a secondary tier of storage. Users treat mailboxes as filing cabinets, driving expensive server storage to expand continually. They respond to storage limits by archiving messages locally with PSTs, which are not managed (or even seen) by IT. The Barracuda Message Archiver dramatically reduces demand for email server storage through attachment stubbing, message/attachment deduplicaton, and compression, while also eliminating the need for PSTs. The Barracuda Message Archiver's indexed archive supports extensive search, auditing/permissions, legal hold, and export helping facilitate eDiscovery and retention. An intuitive interface and powerful feature set shortens response time to ensure messages are found easily when needed. Federated search lets users search across appliances and cloud-based data even when email services are unavailable. Users can search and retrieve archived email anywhere, anytime. Rapidly increasing email volume combined with internal, legal, and regulatory requirements have forced IT organizations to reevaluate their email storage policies. Adding to this pressure is an increase in the number of applications that depend on email for workflow, monitoring, reporting, and other tasks adding to the already overloaded email servers. Storing large amounts of data in the email server puts pressure on backup and recovery, as well as creating challenges for preservation and search for compliance and electronic discovery. Customers frequently leverage VMware to virtualize their email infrastructure, thereby reducing hardware requirements and associate costs. Deploying a virtual email archiving appliance enables organizations to realize these benefits while helping to offload storage requirements. 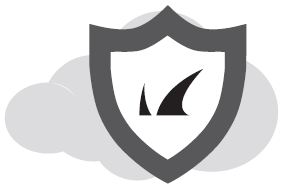 Delivered as a virtual appliance, you can deploy the Barracuda Message Archiver in both vSphere and vCloud Air without requiring additional hardware. Barracuda Message Archiver for vCloud Air is ideal for organizations looking to reduce their email storage requirements and boost user productivity with simple end user access to any email ever sent or received. The cloud-connected virtual appliance uses the optional Barracuda Cloud subscription to move information to the cloud for disaster recovery or as a secondary tier of storage. In addition, the Barracuda Message Archiver for vCloud Air provides a powerful, yet simple platform for eDiscovery and compliance. VMware vCloud Air™ is a secure, dedicated hybrid cloud service operated by VMware, built on the trusted foundation of VMware vSphere. The service supports existing workloads and third-party applications as well as new application development, giving IT a common platform for seamlessly extending its data center to the cloud. Deploying a Barracuda Message Archiver as a virtual appliance eliminates the need for additional hardware, allowing you to quickly and easily deploy archives as needed using your existing virtual infrastructure. Running a virtual appliance means you get rapid deployability and simple appliance upgrades as your archive scales up or storage needs increase. If your Exchange environment is virtualized running a virtual appliance allows your archive to be as close to Exchange as possible whether on premises or in the cloud. A customer has Exchange and Message Archiver on premises but is running a virtual Exchange instance in vCloud Air for disaster recovery purposes. Barracuda Message Archiver should be deployed in an HA cluster to vCloud to ensure the same level of availability of archived messages for end users and legal compliance teams. A customer has either a sudden increase in mail that must be archived (through acquisitions), or has "local" archives that they wish to be federated (joined without actually merging the data). Barracuda Message Archivers deployed in vCloud Air can be easily federated so that searches can be made across one Barracuda Message Archiver or an entire pool. A customer wants to "go cloud," but expects their mail archive to reach well over 50TB. vCloud Air is currently the only cloud provider that can easily adjust the Barracuda Message Archiver container specs to be as large and as powerful as needed to handle searches and other archive functions. *Capacity depends on environment and selected options.